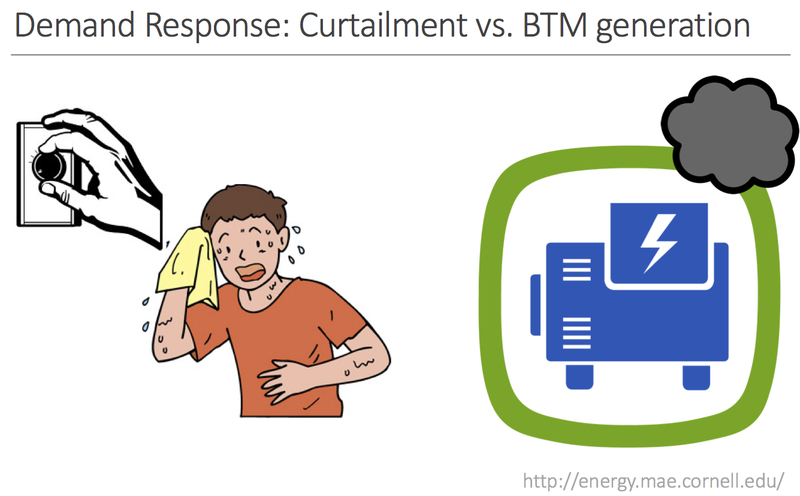 Demand response (DR) programs are traditionally perceived as clean resources of power systems services. However, EERL research suggests that, without proper emission control, the participation of behind-the-meter (BTM) generation in DR programs may result in significant NOx emissions during the periods when atmospheric conditions are most favorable for the formation of ozone pollution. Shifting load from peaking units to BTM generators through DR programs during those periods may result in higher overall NOx emissions, because BTM generators typically have higher emission factors than peaking units. This is the motivation to introduce the concept of “Green” DR resources, defined as those that not only provide power systems reliability services, but also have verifiable environmental benefits or minimal negative environmental impacts. We argue that Green DR programs are key to solving the “peak” problem described in the Introduction, when almost all EGUs are dispatched to meet the demand, leaving little room for other strategies such as environmental dispatch. In essence, Green DR resources hold promise for ensuring resource adequacy and reducing emissions at the same time, thus achieving the cobenefits of power system reliability and protecting public health during periods with peak electricity demand. In general, Green DR resources include measures for load curtailment and clean distributed generation. BTM generators with the latest emission control technologies, such as those meeting Tier 4 emission standard, and with rigorous siting designs, can potentially become part of Green DR resources. Moving forward, we recommend that Green DR resources should be differentiated from the polluting ones, and incentivized for their societal and economic benefits. Furthermore, the participation of low-emitting hydrocarbon-fueled generation in DR programs should not hinder the deployment of nonemitting generation that can reduce the electricity demand during the “peak” periods.